Andhra Leaks Part 1 : Andhra State was Born in a Womb of Violence! History, they say, has all the answers. But, the history books written by Seemandhra writers always contained half-truths. The fact that not many people outside AP know the difference between the two states – Andhra and Andhra Pradesh, shows how the history of this state was distorted. So effective were the distortions of Seemandhra historians that even the Justice Srikrishna Committee got confused between Andhra and Andhra Pradesh states! Every year, the Andhra Pradesh state government carries out full-page advertisements containing Gandhian Potti Sriramulu’s image on November 1st – the state formation day. The fact that Potti Sriramulu’s fast-unto-death was related to Andhra state and not Andhra Pradesh state is deliberately hidden. 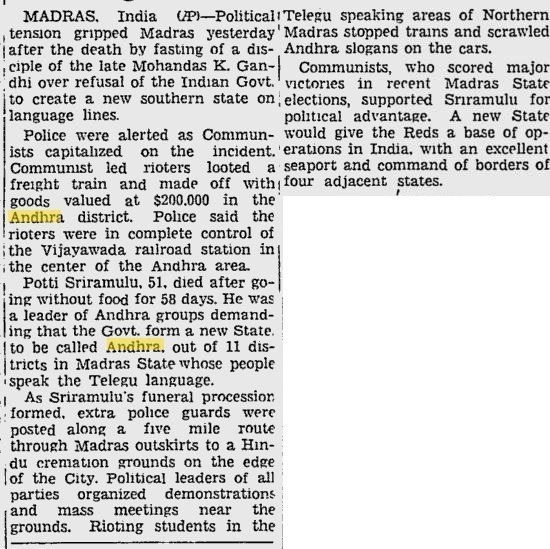 Here is a piece of authentic history that helps us expose the double standards of Seemandhra leaders who constantly refer to Telangana statehood supporters as ‘Separatists’. If demanding a separate state amounts to ‘Separatism’, then our Seemandhra brothers can be safely called the first ‘Separatists’ of independent India. Yes! After India got independence from the British in 1947, it was Telugu speaking people in the erstwhile Madras state who started the first statehood movement. And the reason why they wanted a separate state? They felt that the Telugus were being discriminated by the Tamils! The struggle for a separate Andhra state picked up momentum as soon as India got independent. The union government, under the leadership of Pandit Jawaharlal Nehru was initially sympathetic to the Andhra statehood struggle. But when the leaders of separate Andhra agitation staked their claim on Madras city, the statehood issue turned knotty. This is when the Indian government started postponing the statehood issue citing lack of consensus! Both Tamils and Telugus were not ready to compromise on the Madras city. To up the ante, Potti Sriramulu – a Gandhian undertook a fast-unto-death with a demand for creating Andhra state with Madras as its capital city. Jawaharlal agreed to declare Andhra state sans Madras city when Potti Sriramulu’s fast entered its 50th day. But for some weird reason, Sriramulu did not break his fast even then. He died on 16th December 1952 – the 58 th day of his fast. And all hell broke loose. The whole Andhra region burned for the next few days. History books in Andhra Pradesh and elsewhere tell us that Andhra state was formed due to the ‘sacrifice’ of Potti Sriramulu. But, a careful analyis of newspaper reports and published books tells us a completely different story. “A wave of hysterical emotion swept Andhra territory. Students, youths and workers, led by Communists, attacked Indian government property, cut telegraph wires, damaged railroads, burned rail cars and stoned fire engines, looted railroad restaurants, hoisted black flags of mourning over government buildings. Police, firing on rioters, killed seven and wounded forty. A 13-year-old boy attempted to halt a moving bus by standing in its path, and was run over and killed. So, its the ‘rampant hysteria’ that ‘forced’ the Congress Central Government to concede Andhra! A foreign newspaper – Daytona Beach Morning Journal carried this news item on Dec 17th 1952. It clearly explains what kind of arson, looting and violence followed Potti Sriramulu’s death. I am sure you never heard that our Andhra brothers even looted trains as a part of their statehood struggle! Isn’t it clear how the unprecedented violence forced the centre’s hand in taking a call on the statehood issue? Even in Telugu, several historians have clearly recorded what happened after Potti Sriramulu’s death. “ఆయన ఆత్మాహుతితో ఆంధ్ర ప్రజల ఉద్రేకానికి అడ్డు లేకుండా పోయింది. మూడు రోజుల పాటు ఆంధ్ర జిల్లాలలో ఎడతెగని దహనకాండ కొనసాగింది. అనేక చోట్ల పోలీసులు కాల్పులు జరిపారు” అని రాశారు. ఇక బి.ఎన్. శాస్త్రి గారు “ఆంధ్రదేశ చరిత్ర – సంస్కృతి” పుస్తకం పేజీ 576 లో ఇలా పేర్కొన్నారు. The spate of violent incidents that led to the declaration of Andhra state evoked strong reactions from political leaders of that era. “Problems have arisen because Government was neither bold not quick. Because of the way Andhra had come about, he said, the impression was gaining that it was very difficult to make the Government move from status quo unless it was compelled, and the way it was compelled in this case was dangerous for the good of the country. It was said the Andhra Bill would not have come out but for the hungerstrike of an individual and the violence that followed it. Yielding to this kind of pressure and violence was the worst thing for a Government to do because it would encourage violence in future. While history is thus, Seemandhra leaders referring the Telangana agitation as separatist and violent is nothing but pot calling the kettle black. Seemandhra people led one of the first and most violent statehood struggles in independent India. Yet, they try to belittle the Telangana movement shamelessly. We do not support violence of any kind. Nor are we criticizing our Andhra counterparts for what has happened during the Andhra statehood struggle. Our intention in bringing out these facts is only to expose the hypocritical nature of Seemandhra leadership. Next: Andhra Leaks Part 2: How Andhra State Came Into Existence.